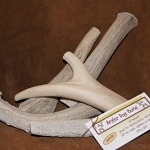 Large antler chew dog bones recommended for breeds such as: Labradors Retriever, Golden Retriever, German Shepherd, Boxer, Bulldog, Australian Shepard, Standard Poodle, Pointer (German Shorthaired), Collie or Husky to name a few. These breeds may also enjoy an extra large antler chew depending on overall size, temperament or personal preference. 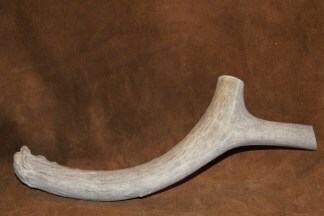 Our extra large antler dog chew is 2 inches longer and thinker in diameter than the large. An Antler Dog Chew is set apart from traditional bones as they will not stain your carpet, splinter or turn into slimy goo. They are naturally shed deer or elk antler pieces. No fillers, preservatives, added color or anything else! It’s just a bone the way nature intended! No animals are hurt in the collection of this bone! Our extra large antler dog chew is 2 inches longer and much thicker in diameter than the large. Determining the best choice between the two sizes may overlap with many breeds depending on size and temperament of the dog, or preference. Extra Large bones are recommended for breeds such as: Labradors Retriever, Golden Retriever, German Shepherd, or Husky. They are especially good for Mastiff, Rottweiler, Great Dane, Irish Wolfhound, Bernese Mountain Dog, or similar sized. Each order is packed individually, please contact us you have a special request! 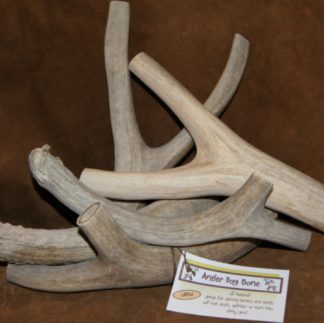 Our all natural antler dog chews are naturally shed antlers, gathered in the forest or on ranch lands at various times of the year around Colorado, Utah & New Mexico, they are all weathered at different stages. The slight weathering may lead to discoloration or outer hairline cracking. Older dogs, mild chewers, or dogs who only get them for short periods of time do not need to be concerned as much for the weathered effects, in fact it allows these dogs to get the mineral benefit much easier.